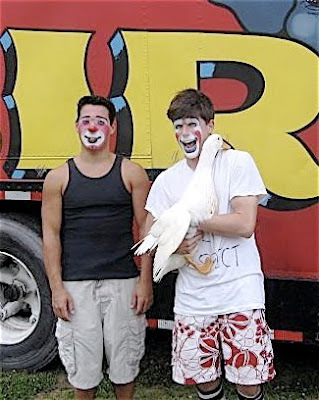 Senor Pato, comedy mascot of the Kelly-Miller Circus, passed away this morning while on tour in Texas. Our deepest and most sincere sympathy goes out today to Steve, Ryan and the whole America's Own crew. It's so insanely obvious, why haven't we ever fully explored this, but WHY doesn't the Physical and Visual theater community have MUCH stronger ties to the hearing impaired community??? We have GREAT shows without a word of dialog and we beat our heads against the wall trying to build an audience. The hearing impaired community are looking for entertainment that offers just that! Is anyone reaching out to this market? These artists? Bringing them into our fold and vice versa? My Clown College '97 classmate, Aziz Gual, with GREAT gag. Excellent job! Dimitri Bogatirev and Iryna Ivanytska of Aga-Boom in Cirque's "O" in Las Vegas. The panto horse gag starts at about the 1:35 mark. Henry Ringling North, brother of John Ringling North and nephew of the original Ringling brothers, recipient of the Silver Star for his service in WWII and who served at various times as vice president, treasurer, director and operations chief of the Greatest Show on Earth. 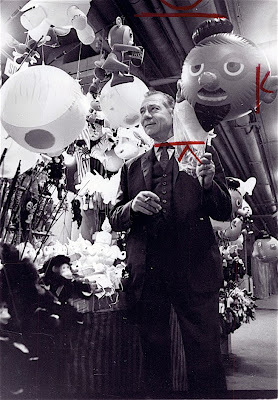 Today his son John Ringling North II owns and operates the Kelly-Miller Circus. 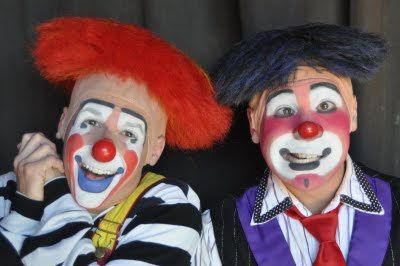 I have only heard absolutely glowing reviews of this year's all-new 2010 edition which again features two of America's best circus clowns, perennial clownalley.net favorites Steve Copeland and Ryan Combs. Mr. Carlyon discussed his biography Dan Rice: The Most Famous Man You've Never Heard Of, published by Public Affairs. 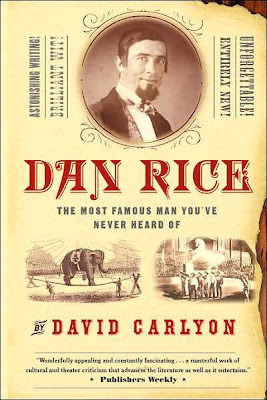 Dan Rice was a 19th century showman, humorist, and public office-seeker. 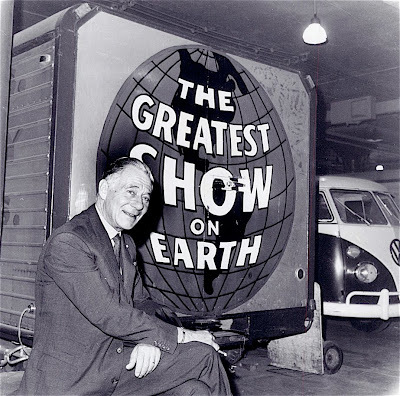 He was also a popular talking clown who began his own circus titled Dan Rice's Great Show. His routines included speaking on issues of the day, and according to David Carylon, his act's popularity brought national attention. This notoriety allowed him to run for office several times including a brief campaign for President. Then around the mid-19th Century, Americans became more interested in the theater and began to consider the circus as unrefined and lowbrow. Dan Rice was downgraded to children's entertainment, and eventually faded from the American memory. From the 28th annual Festival International du Cirque de Monte-Carlo. If you've ever wondered what Grock's act would sound like in English, performed by a different guy, here it is. Pierrot Bidon, who has died aged 56, was the creative spirit behind the anarchical French circus Archaos; his mesmerising, pyrotechnic spectaculars popularised an outmoded form with a new audience, clearing the way for today's huge productions, such as Cirque de Soleil, to sweep the globe. When he started Archaos in 1984 circus seemed rooted in traditions of animals and acrobats which had barely changed since PT Barnum's heyday a century before. But Bidon decided to change all that. In place of lions, he introduced a pride of jousting cranes, car-crushers and burnt-out monster trucks. Acrobats swung not from trapezes but from the scoops of giant mechanical diggers. If their athleticism did not impress, they always reserved the power to shock. 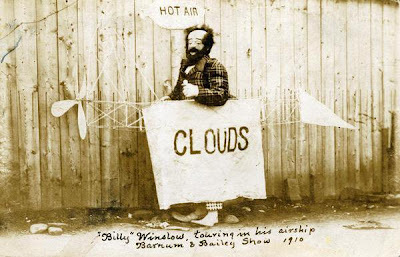 Performers were set on fire as they flew through the air; other acts seemed to involve horrible accidents, as when a motorcyclist would "fall off" a high-wire. Juggling was greatly enlivened by the use of running chainsaws and the almost sexual allure of danger was emphasised on occasions when an Archaos member strode off after a daredevil feat to plant a lengthy kiss on the lips of the prettiest girl at ringside. 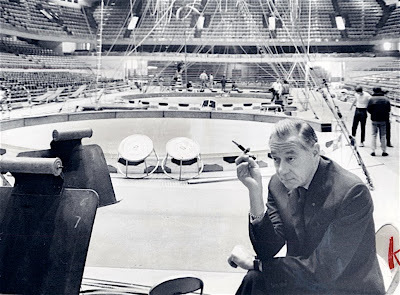 Children, far from being encouraged to join in the fun, were banned from many of Bidon's shows. "It is important to be mad and crazy," he said. "We must not look on life as normal. I like it when they say: 'You are not normal.' I say it is important to be insane – it makes the world a more pleasant place." He was born Pierre Pillot on New Year's Day 1954 in Le Mans. 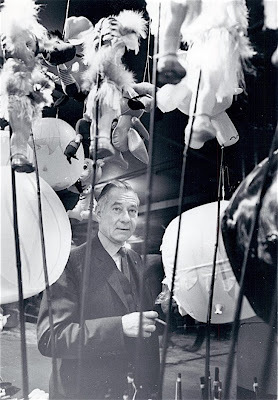 By his early twenties he was ensconced in a circus that could hardly have been more stately or traditional. Le Cirque Bidon (bidon means "rubbish" in French) was housed in three horse-drawn carriages. Owing to the fact that they could not afford a big-top, its seven members performed in the open air, plying a route through the backwaters of France to entertain villages bereft of more mainstream theatricals. In the late 1970s he left the circus (but took with him its name) and set out to revolutionise the genre. To effect this change, he recruited performers from outside the circus world. "No one at Archaos is born in a circus," he said later. "So we don't have all the influence of tradition on our shoulders. We can invent everything. We are free." It was a liberated approach that caused an instant sensation and, quickly, the troupe became highly sought-after. Just three years after their debut they were starring at the Avignon Festival; a year later they arrived in Britain, where they formed a shocking and equally successful counterpoint to the more usual charm of China's Shenyang Acrobatic Troupe. Thereafter Archaos returned time and again to Britain, and became a fixture at the Edinburgh festival. Before one trip, aware of his duty of care to his performers, Bidon announced to a journalist that he was bringing 400 litres of wine with him across the Channel. The news reached Her Majesty's Customs and Excise, but despite their best efforts the stash was never located. The Archaos publicity machine was almost as effective as its performances. Bidon once summoned a host of photographers to central Edinburgh. When he pulled up to the venue, the car in which he was driving split in half, ensuring a page-filling photo. Indeed, with his paternalistic attitude and curly-haired, devil-may-care demeanour, a new generation was tempted to run away to the circus: a journalist for French Vogue was one who apparently did so; the receptionist at the Groucho Club another. By the early 1990s, Archaos was touring the world from Cologne to New York City, drawing huge audiences. In 1995, however, Bidon left the troupe, joining forces with Gerry Cottle to set up the Archaos-inspired Circus of Horrors in Britain, which continues to play to a cult following today. 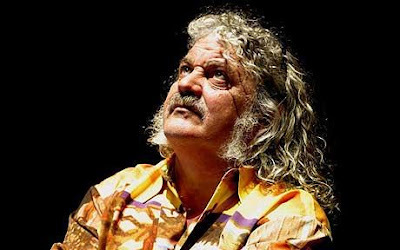 Bidon then left for Brazil, where he set up Circo da Madrugada. By this time his desire to shock had been replaced by a desire to help the less fortunate. To this end he set up circus schools in Rio before, in 1998, heading to Guinea to start the Cirque Baobab, which proved another success and also toured extensively. In his last years, Pierrot Bidon moved to Marseilles then Arles, where he continued to work on new ideas. His last show, Place de Anges (2007), told the tale of a group of renegade angels granted 24 hours parole from heaven. Swinging high above the ring, the group was drawn down by earthly temptations, wings moulting, engulfing the audience in tonnes of feathers. He is survived by his wife Ana and two sons. I believe that this is the footage that John Towsen has been searching for. May our conscience be sound, tho’ our fortune be rotten. The harvest of life; Love, wit and good humour. May the Lovers of a glass never want a bottle. On the stage, however, he possessed every vice imaginable. He was “a thief, a coward – a most detestable coward, cruel, treacherous, unmanly, ungenerous, greedy, and the truth was not in him”. He feigned condolence for the very misfortunes he had caused. After a self-approving chuckle he would give a contemptuous look, half pity, half derision, at his dupe, and then show great caution to escape discovery. It was said that “speech would have been thrown away in his performance of Clown; every limb of him had a language”. His audiences were forced to doubt whether honesty were not a kind of prejudice. For all his sins, multiplied up to murder, the children, said a wise contemporary critic:“loved him, yearned for him, wanted to share in his doings; felt a little volcano raging within us whilst he was perpetrating his atrocities. ‘He’ll be found out!’ and we clasped our tiny hands till the nails cut into the palms; no, he’s safe, and away goes the monstrous booty into that leviathan pocket of his, that receptacle of all sorts of edibles, and occasionally of kettles full of boiling water, and even lighted candles”. Ah! So they saw Grimaldi in his pomp. Andrew McConnell Stott has had fun with this life, weaving in and out of Georgian theatre, the mechanics of tomfoolery, the sights and sounds of London, the dissolute crowd, who, according to Sir Walter Scott, prosecuted “their debaucheries so openly that it would degrade a bagnio” . 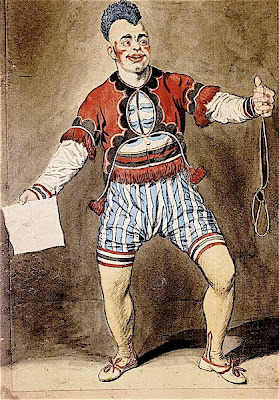 This is a guide to the pratfalls and slapstick of the history of pantomime: though Grimaldi was a clown, he was neither a children’s entertainer nor a circus act. The Regency’s most popular and consistently lucrative form of entertainment was pantomime, and a mirror of the age with its ridiculous extravagance, liberal, self-regarding wit and obsession with being bang up to date. And the story of The Great Joe is one of great invention, for what he invented was himself. HE WAS BORN a Cockney in December 1778, his father an Italian, a brilliant acrobatic dancer, a founder of a school of pantomime at Drury Lane, and an out-and-out blackguard: “Grim-all-day” was coined of him. It was reckoned he hightailed it across to England because of a lurid scandal concerning his blood-relationship to the grotesque creature who passed as his wife. His violence was unceasing: he smashed his children’s heads on the kitchen wall, he left his wife blinded for 10 days after a particularly savage beating. The infant phenomenon that was wee Joe, age two and a half, first trod the boards at Sadler’s Wells in 1781. By the time he was 17, he was one of the leading lights of the company: the troupe included Thomas Dibdin, a genius at light verse; the veteran French clown Dubois; and “the ever sportive, elegant and flexile Mrs Wybrow”, a Columbine who gave “various and scientific displays with the broadsword”. Sadler’s Wells offered him full scope for the inherited comic genius he was richly developing. Stott sums up the new face Grimaldi had devised: “the whole was topped with a wig, rather a series of wigs . . . red Mohicans, blue three-tufted plumes, an orange and green thistle that was half plumber’s plunger, half fox’s brush”. Each programme of the boisterous theatre had a burletta, a grand spectacle and pantomime, with various songs, dances and feats of strength or agility as well. So transparent my dress you may see through it. Who in dress so transparent their body’s tie. To see ’em it quite shocks my modesty. After a winter season in Dublin, which was a happy time for Grimaldi and his wife but a financial disaster for his backers, the rising star left Sheridan’s shaky Sadler’s Wells for Covent Garden. Then there came the amazing year of Mother Goose , and superstardom. Cobbled together by Thomas Dibdin in a mighty rush, just a month before Christmas 1807, this from-scratch show sold over 300,000 tickets and is still the longest-running pantomime in history. The encomiums were fulsom and many: “as perfect a performance, as need be wished”, said one reviewer. The Lord Chancellor, Lord Eldon, returned 11 times: “Never, never, did I see a leg of mutton stolen with such superhuman impudence as by that man”. And: “His Clown has not been equalled – we never expect to see it surpassed. He has arrived at an acme of all clownery”. And all this at a time when Europe was under the cosh of Bonapart’s murderous empire. Indeed, reckons Stott, Boney may be credited with inspiring the birth of the modern entertainment industry in all its sumptuous, glamorous, vapid and commercial glory, as theatre was never so profitable or popular as it was during the Napoleonic wars. A RECKONING THERE had to be, and Stott sums it up: “Grimaldi struggled with depression . . . His first wife died in childbirth, his son would go on to drink himself to death. The extreme physicality of his performances meant that he was disabled and in considerable pain in later life”. He makes out that Grimaldi “instituted the modern figure of the glum comedian”, which for me is more of a publisher’s come-on. It was on a final visit to Dublin that Grimaldi’s tortured limbs gave way. He had been in good form in Covent Garden with a new show of Harlequin and Friar Bacon . There was some excellent business with a scene in which he invaded a lady’s boudoir dressed as a chimney sweep, left his sooty imprint all over her white chairs and bed, and had the house in stitches, including a chortling George IV. There was a new, and revolutionary piece of machinery, showing a diorama painted with views that turned on rollers, to accompany Harlequin and Columbine’s voyage across the stage from Holyhead to Dublin Bay. A reviewer in 1820 waxed particularly lyrical at this point: “. . . the sky brightens, and morning shows the mountains round the bay of Dubin. The representation is accurate in outline of those picturesque hills, and this whole scene received great applause”. (Not a review mentioned by Stott). But for Joey the great applause had died away. He “called one of Dublin’s most eminent physicians”, who diagnosed him as suffering from “premature old age”. With legs barely able carry him, his spine curled with pain, he left Ireland, left the stage, left those who had seen him to say “Ah! You should have seen Grimaldi!”. "Great Irish Famine" redirects here. For the 1740–1741 famine, see Irish Famine (1740–1741). Skibbereen 1847 by Cork artist James Mahony (1810–1879), commissioned by Illustrated London News 1847. The Great Famine (Irish: an Gorta Mór, IPA: [ənˠ ˈɡɔɾˠtˠə ˈmˠoːɾˠ], the Great Hunger; an Drochshaol, [ənˠ ˈdˠɾɔxˌhiːlˠ], the Bad Life) was a period of mass starvation, disease and emigration in Ireland between 1845 and 1852 during which the island's population dropped by 20 to 25 percent. Approximately one million people died and a million more emigrated from Ireland. The proximate cause of famine was a potato disease commonly known as potato blight. Although blight ravaged potato crops throughout Europe during the 1840s, the impact and human cost in Ireland – where a third of the population was entirely dependent on the potato for food – was exacerbated by a host of political, social and economic factors which remain the subject of historical debate. The famine was a watershed in the history of Ireland. Its effects permanently changed the island's demographic, political and cultural landscape. For both the native Irish and those in the resulting diaspora, the famine entered folk memory and became a rallying point for various nationalist movements. Modern historians regard it as a dividing line in the Irish historical narrative, referring to the preceding period of Irish history as "pre-Famine." Starting in 1801, Ireland had been directly governed, under the Act of Union, as part of the United Kingdom. Executive power lay in the hands of the Lord Lieutenant of Ireland and Chief Secretary for Ireland, both of whom were appointed by the British government. Ireland sent 105 members of parliament to the House of Commons of the United Kingdom, and Irish representative peers elected twenty-eight of their own number to sit for life in the House of Lords. Between 1832 and 1859, seventy percent of Irish representatives were landowners or the sons of landowners. In the forty years that followed the union, successive British governments grappled with the problems of governing a country which had, as Benjamin Disraeli put it in 1844, "a starving population, an absentee aristocracy, and an alien Church, and in addition the weakest executive in the world." One historian calculated that between 1801 and 1845, there had been 114 commissions and 61 special committees inquiring into the state of Ireland and that "without exception their findings prophesied disaster; Ireland was on the verge of starvation, her population rapidly increasing, three-quarters of her labourers unemployed, housing conditions appalling and the standard of living unbelievably low." This was a contrast to Britain, which was beginning to enjoy the modern prosperity of the Victorian and Industrial ages. Laws against education of Irish Catholics and possession of land had made such a progress impossible until the penal laws were repealed only fifty years before the Famine, but the economic recovery was slow because the landlord families still kept their land. In the 1600s and 1700s, Irish Roman Catholic citizens had been prohibited by the penal laws from owning land, from leasing land; from voting, from holding political office; from living in a corporate town or within five miles of a corporate town, from obtaining education, from entering a profession, and from doing many other things that are necessary in order to succeed and prosper in life. The laws had largely been reformed by 1793, and in 1829, Irish Catholics could again sit in parliament following the Act of Emancipation. Catholic emancipation had been achieved in 1829, and Catholics made up 80 percent of the population, the bulk of whom lived in conditions of poverty and insecurity. At the top of the "social pyramid" was the "ascendancy class," the English and Anglo-Irish families who owned most of the land, and who had more or less limitless power over their tenants. Some of their estates were vast: the Earl of Lucan, for example, owned over 60,000 acres (240 km2). Many of these landlords lived in England and were called "absentee landlords". They used agents to administer their property for them, with the revenue generated being sent to England. A number of the absentee landlords living in England never set foot in Ireland. They took their rents from their "impoverished tenants" or paid them minimal wages to raise crops and livestock for export. In 1843, the British Government considered that the land question in Ireland was the root cause of disaffection in the country. They set up a Royal Commission, chaired by the Earl of Devon, to inquire into the laws with regard to the occupation of land in Ireland. Daniel O'Connell described this commission as perfectly one-sided, being made up of landlords and no tenants. Devon in February 1845 reported that "It would be impossible adequately to describe the privations which they [Irish labourer and his family] habitually and silently endure . . . in many districts their only food is the potato, their only beverage water . . . their cabins are seldom a protection against the weather... a bed or a blanket is a rare luxury . . . and nearly in all their pig and a manure heap constitute their only property." The Commissioners concluded that they could not "forbear expressing our strong sense of the patient endurance which the labouring classes have exhibited under sufferings greater, we believe, than the people of any other country in Europe have to sustain." The commission stated that the principal cause was the bad relations between the landlord and tenant. There was no hereditary loyalty, feudal tie or paternalism as existed in England. Ireland was a conquered country, with the Earl of Clare speaking of the landlords saying "confiscation is their common title." According to Woodham-Smith, the landlords regarded the land as a source of income from which to extract as much money as possible. With the Irish "brooding over their discontent in sullen indignation" according to the Earl of Clare, Ireland was seen as a hostile place in which to live, and as a consequence absentee landlords were common, with some only visiting their property once or twice in a lifetime. The Rents from Ireland were then spent in England, it being estimated that in 1842 £6,000,000 was remitted out of Ireland. Rent collection was left in the hands of the landlords' agents, whose ability according to Woodham-Smith, was measured by the amount of money they could contrive to extract. During the eighteenth century a new system for dealing with the landlord's property was introduced in the form of the "middleman system". This assured the landlord of a regular income, and relieved them of any responsibility; the tenants however were then subject to exploitation through these middlemen. Described by the Commission as "the most oppressive species of tyrant that ever lent assistance to the destruction of a country," they were invariably described as "land sharks" and "bloodsuckers." The middlemen leased large tracts of land from the landlords on long leases with fixed rents, which they then sublet as they saw fit. They split the holding into smaller and smaller parcels to increase the amounts of rents they could then obtain, a system called conacre. Tenants could be evicted for reasons such as non-payment of rents (which were very high), or if the landlord decided to raise sheep instead of grain crops. The cottier paid his rent by working for the landlord. Any improvements made on the holdings by the tenants became the property of the landlords when the lease expired or was terminated, which acted as a disincentive to improvements. The tenants had no security of tenure on the land; being tenants "at will" they could be turned out whenever the landlord chose. This class of tenant made up the majority of tenant farmers in Ireland, the exception being in Ulster where there existed a practice known as "tenant right", under which tenants were compensated for any improvements made to their holdings. The commission according to Woodham-Smith stated that "the superior prosperity and tranquility of Ulster, compared with the rest of Ireland, were due to tenant right." Landlords in Ireland used their powers without remorse, and the people lived in dread of them. In these circumstances Woodham-Smith writes "industry and enterprise were extinguished and a peasantry created which was one of the most destitute in Europe." In 1845, 24% of all Irish tenant farms were of 0.4 to 2 hectares (one to five acres) in size, while 40% were of two to six hectares (five to fifteen acres). Holdings were so small that only potatoes—no other crop—would suffice to feed a family. The British Government reported, shortly before the famine, that poverty was so widespread that one third of all Irish small holdings could not support their families, after paying their rent, except by earnings of seasonal migrant labour in England and Scotland. Following the famine, reforms were implemented making it illegal to further divide land holdings. The 1841 census showed a population of just over eight million. Two-thirds of those depended on agriculture for their survival, but they rarely received a working wage. They had to work for their landlords in return for the patch of land they needed in order to grow enough food for their own families. This was the system which forced Ireland and its peasantry into monoculture, as only the potato could be grown in sufficient quantity. The rights to a plot of land in Ireland could mean the difference between life and death in the early 19th century. The potato was introduced to Ireland as a garden crop of the gentry. By the late seventeenth century it had become widespread as a supplementary rather than a principal food, as the main diet still revolved around butter, milk and grain products. In the first two decades of the eighteenth century, however, it became a base food of the poor, especially in winter. The expansion of the economy between 1760 and 1815 saw the potato make inroads in the diet of the people and become a staple food all the year round for the cottier and small farm class. The potato's spread was essential to the development of the cottier system, delivering an extremely cheap workforce, but at the cost of lower living standards. For the labourer it was essentially a potato wage that shaped the expanding agrarian economy. The expansion of tillage led to an inevitable expansion of the potato acreage, and an expansion of the cottier class. By 1841, there were over half a million cottiers, with 1.75 million dependents. The principal beneficiary of this system was the English consumer. The Celtic grazing lands of... Ireland had been used to pasture cows for centuries. The British colonized... the Irish, transforming much of their countryside into an extended grazing land to raise cattle for a hungry consumer market at home... The British taste for beef had a devastating impact on the impoverished and disenfranchised people of... Ireland... Pushed off the best pasture land and forced to farm smaller plots of marginal land, the Irish turned to the potato, a crop that could be grown abundantly in less favorable soil. Eventually, cows took over much of Ireland, leaving the native population virtually dependent on the potato for survival. Prior to the arrival in Ireland of the disease Phytophthora infestans, commonly known as blight, there were only two main potato plant diseases. One was called 'dry rot' or 'taint' and the other was a virus, known popularly as 'curl'. According to W.C. Paddock however, Phytophthora infestans is an oomycete, not a fungus. In 1851 the Census of Ireland Commissioners recorded twenty-four failures of the potato crop going back to 1728, of varying severity. In 1739 the crop was "entirely destroyed", and again in 1740. In 1770 the crop largely failed again. In 1800 there was another "general" failure, and in 1807 half the crop was lost. In 1821 and 1822 the potato crop failed completely in Munster and Connaught, and 1830 and 1831 were years of failure in Mayo, Donegal and Galway. In 1832, 1833, 1834 and 1836 a large number of districts suffered serious loss, and in 1835 the potato failed in Ulster. 1836 and 1837 brought "extensive" failures throughout Ireland and again in 1839 failure was universal throughout the country; both 1841 and 1844 potato crop failure was widespread. According to Woodham-Smith, "the unreliability of the potato crop was an accepted fact in Ireland. How and when the blight Phytophthora infestans arrived in Europe is still uncertain; according to P.M.A Bourke, however, it almost certainly was not present prior to 1842, and probably arrived in 1844. At least one of the sources of the infection suggests it may have originated in the northern Andes region of South America, Peru in particular. It was then conveyed to Europe on ships carrying guano, where it was in great demand as a fertiliser on European and British farms. In 1844 Irish newspapers carried reports concerning a disease which for two years had attacked the potato crops in America. According to James Donnelly a likely source was the eastern United States, where in 1843 and 1844 blight largely destroyed the potato crops. He suggests that ships from Baltimore, Philadelphia or New York could have brought diseased potatoes to European ports. W.C. Paddock suggests that it was transported on potatoes being carried to feed passengers on clipper ships sailing from America to Ireland. Once it was introduced it spread rapidly. By late summer and early autumn of 1845 it had spread throughout the greater part of northern and central Europe. Belgium, Holland, northern France and southern England by mid-August had all been stricken. On 16 August the Gardeners' Chronicle and Horticultural Gazette printed a report which described 'a blight of unusual character' in the Isle of Wight. A week later, on 23 August, it reported that 'A fearful malady has broken out among the potato crop... In Belgium the fields are said to be completely desolated. There is hardly a sound sample in Covent Garden market... As for cure for this distemper, there is none...' These reports were extensively covered in Irish newspapers. On 13 September the Gardeners' Chronicle made 'a dramatic announcement': 'We stop the Press with very great regret to announce that the potato Murrain has unequivocally declared itself in Ireland.' The British Government were nevertheless optimistic through the next few weeks. Crop loss in 1845 has been estimated at a high of 50% to one third. The Mansion House Committee in Dublin, to which hundreds of letters were directed from all over Ireland, claimed on 19 November 1845 to have ascertained beyond the shadow of doubt that considerably more than one-third of the entire of the potato crop ... has been already destroyed'. In 1846 three-quarters of the harvest was lost to blight. By December a third of a million destitute people were employed in public works. According to Cormac Ó Gráda the first attack of potato blight caused considerable hardship on rural Ireland, from the autumn of 1846, when the first deaths from starvation were recorded. Seed potatoes were scarce in 1847, little had been sown, so despite average yields, hunger continued. 1848 yields would be only two thirds of normal. As over 3 million Irish people were totally dependent on potatoes for food, hunger and famine were inevitable. The Corporation of Dublin sent a memorial to the Queen, "praying her" to call Parliament together early (Parliament was at this time prorogued), and to recommend the requisition of some public money for public works, especially railways in Ireland. The Town Council of Belfast met and made similar suggestions, but neither body asked for charity, according to Mitchel. "They demanded that, if Ireland was indeed an Integral part of the realm, the common exchequer of both islands should be used—not to give alms, but to provide employment on public works of general utility." It was Mitchel's opinion that "if Yorkshire and Lancashire had sustained a like calamity in England, there is no doubt such measures as these would have been taken, promptly and liberally." A deputation from the citizens of Dublin, including the Duke of Leinster, the Lord Mayor, Lord Cloncurry, and Daniel O'Connell, went to the current Lord Lieutenant of Ireland, and offered suggestions, such as opening the ports to foreign corn for a time, stopping distillation from grain, or providing public works; that this was extremely urgent, as millions of people would shortly be without food. Lord Heytesbury told them they "were premature", and told them not to be alarmed, that learned men (Playfair and Lindley) had been sent from England to enquire into all those matters; and that the Inspectors of Constabulary and Stipendiary Magistrates were charged with making constant reports from their districts; and there was no "immediate pressure on the market". Of these reports from Lord Heytesbury, Peel in a letter to Sir James Graham was to say that he found the accounts "very alarming", though he reminded him that there was, according to Woodham-Smith "always a tendency to exaggeration in Irish news". On 8 December 1845, Daniel O'Connell, in the Repeal Association, proposed the following remedies to the pending disaster. One of the first things he suggested was the introduction of "Tenant-Right" as practised in Ulster, giving the landlord a fair rent for his land, but giving the tenant compensation for any money he might have laid out on the land in permanent improvements. O'Connell then pointed out the means used by the Belgian legislature during the same season: shutting their ports against the export of provisions, but opening them to imports. He suggested that if Ireland had a domestic Parliament the ports would be thrown open and the abundant crops raised in Ireland would be kept for the people of Ireland. O'Connell maintained that only an Irish parliament would provide for the people both food and employment, saying that a repeal of the Act of Union was a necessity and Ireland's only hope. John Mitchel, one of the leading political writers of Young Ireland, as early as 1844, in The Nation raised the issue of the "Potato Disease" in Ireland noting how powerful an agent hunger had been in certain revolutions. On 14 February 1846, he put forward his views on "the wretched way in which the famine was being trifled with", and asked, had not the Government even yet any conception that there might be soon "millions of human beings in Ireland having nothing to eat." In an article on "English Rule" on 7 March 1846, Mitchel wrote that the Irish People were "expecting famine day by day" and they attributed it collectively, not to "the rule of heaven as to the greedy and cruel policy of England." He continued in the same article to write that the people "believe that the season as they roll are but ministers of England's rapacity; that their starving children cannot sit down to their scanty meal but they see the harpy claw of England in their dish." The people, Mitchel wrote, watched as their "food melting in rottenness off the face of the earth," all the while watching "heavy-laden ships, freighted with the yellow corn their own hands have sown and reaped, spreading all sail for England." The Almighty, indeed, sent the potato blight, but the English created the Famine." Mitchel was charged with sedition because of his writings, but this charge was dropped and he was convicted by a packed jury under the newly-enacted Treason Felony Act and sentenced to 14 years transportation to Bermuda. The Nation according to Charles Gavan Duffy, insisted that the one remedy was that which the rest of Europe had adopted, which even the parliaments of the Pale had adopted in periods of distress, which was to retain in the country the food raised by her people till the people were fed. Ireland at this time was, according to the Act of Union of 1801, an integral part of the British imperial homeland, "the richest empire on the globe," and was "the most fertile portion of that empire," in addition; Ireland was sheltered by both "... Habeas Corpus and trial by jury ...". And yet Ireland's elected representatives seemed powerless to act on the country's behalf as Members of the British Parliament. Commenting on this at the time John Mitchel wrote: "That an island which is said to be an integral part of the richest empire on the globe ... should in five years lose two and a half millions of its people (more than one fourth) by hunger, and fever the consequence of hunger, and flight beyond sea to escape from hunger ..."
The period of the potato blight in Ireland from 1845–51 was full of political confrontation. The mass movement for Repeal of the Act of Union had failed in its objectives by the time its founder Daniel O'Connell died in 1847. A more radical Young Ireland group seceded from the Repeal movement and attempted an armed rebellion in the Young Irelander Rebellion of 1848. It was unsuccessful. F.S.L. Lyons characterised the initial response of the British government to the early less severe phase of the famine as "prompt and relatively successful." Confronted by widespread crop failure in the autumn of 1845, Prime Minister Sir Robert Peel purchased £100,000 worth of Indian corn and corn meal secretly from America. Baring Bros & Co had to act as agents for the government. The government hoped that they would not "stifle private enterprise" and that their actions would not act as a disincentive to local relief efforts. Due to weather conditions, the first shipment did not arrive in Ireland until the beginning of February 1846. This corn was then re-sold for a penny a pound. The corn when it arrived had not been ground and was inedible, and this task involved a long and complicated process if it was to be done correctly and it was unlikely to be carried out locally. In addition, before the Indian meal could be consumed, it had to be 'very much' cooked again, or eating it could result in severe bowel complaints. Because of maize's yellow colour, and the fact that it had to be ground twice, it became known in Ireland as 'Peel's brimstone'. In 1846 Peel then moved to repeal the Corn Laws, tariffs on grain which kept the price of bread artificially high. The famine situation worsened during 1846 and the repeal of the Corn Laws in that year did little to help the starving Irish; the measure split the Conservative Party, leading to the fall of Peel's ministry. In March Peel set up a programme of public works in Ireland but was forced to resign as Prime Minister on 29 June." This fall came on the 25 June, when he was defeated in the House of Commons on a motion that the Irish Coercion Bill be read a second time. According to Michael Doheny, the majority against him was seventy-three, and it was made of the "Whig party, the extreme Conservatives, the ultra-Radicals and Irish Repealers." Ten days after, Lord John Russell assumed the seals of office. A memorial to the victims of the Doolough Tragedy (30 March 1849). In order to continue receiving relief, hundreds were instructed to travel many miles in bad weather. A large number died on the journey. Christine Kinealy, a University of Liverpool fellow and author of two texts on the famine, Irish Famine: This Great Calamity and A Death-Dealing Famine, writes that Irish exports of calves, livestock (except pigs), bacon and ham actually increased during the famine. The food was shipped under guard from the most famine-stricken parts of Ireland. However, the poor had no money to buy food and the government then did not ban exports. Weary men, what reap ye? Golden corn for the stranger. There's a proud array of soldiers—what do they round your door? They guard our master's granaries from the thin hands of the poor. William Smith O'Brien, speaking on the subject of charity in a speech to the Repeal Association, February 1845, applauded the fact that the universal sentiment on the subject of charity was that they would accept no English charity. He expressed the view that the resources of this country were still abundantly adequate to maintain the population and that until those resources had been utterly exhausted, he hoped that there was no one in "Ireland who will so degrade himself as to ask the aid of a subscription from England." Mitchel wrote in his The Last Conquest of Ireland (Perhaps), on the same subject, that no one from Ireland ever asked for charity during this period, and that it was England who sought charity on Ireland's behalf, and, having received it, was also responsible for administering it. He suggested that it has been carefully inculcated by the British Press, "that the moment Ireland fell into distress, she became an abject beggar at England's gate, and that she even craved alms from all mankind." He affirmed that in Ireland no one ever asked alms or favours of any kind from England or any other nation, but that it was England herself that begged for Ireland. He suggested that it was England that "sent 'round the hat over all the globe, asking a penny for the love of God to relieve the poor Irish," and constituting herself the agent of all that charity, took all the profit of it. Large sums of money were donated by charities; Calcutta is credited with making the first donation of £14,000. The money was raised by Irish soldiers serving there and Irish people employed by the East India Company. Pope Pius IX sent funds and Queen Victoria donated £2,000. Upon the famine arose the wide spread system of proselytism ... and a network of well-intentioned Protestant associations spread over the poorer parts of the country, which in return for soup and other help endeavoured to gather the people into their churches and schools...The movement left seeds of bitterness that have not yet died out, and Protestants, and not altogether excluding Friends, sacrificed much of the influence for good they might have had..."
Private initiatives such as The Central Relief Committee of the Society of Friends (Quakers) attempted to fill the gap caused by the end of government relief and eventually the government reinstated the relief works, although bureaucracy slowed the release of food supplies. In 1845, Ottoman Sultan Abdülmecid declared his intention to send 10,000 sterling to Irish farmers but Queen Victoria requested that the Sultan send only 1,000 sterling, because she had sent only 2,000 sterling. The Sultan sent the 1,000 sterling but also secretly sent 3 ships full of food. The English courts tried to block the ships, but the food arrived at Drogheda harbour and was left there by Ottoman sailors. In 1847, midway through the Great Irish Famine (1845–1849), a group of American Indian Choctaws collected $710 (although many articles say the original amount was $170 after a misprint in Angie Debo's The Rise and Fall of the Choctaw Republic) and sent it to help starving Irish men, women and children. "It had been just 16 years since the Choctaw people had experienced the Trail of Tears, and they had faced starvation... It was an amazing gesture." according to Judy Allen, editor of the Choctaw Nation of Oklahoma's newspaper, Bishinik, based at the Oklahoma Choctaw tribal headquarters in Durant, Oklahoma. To mark the 150th anniversary, eight Irish people retraced the Trail of Tears, and the donation was publicly commemorated by President Mary Robinson. Landlords were responsible for paying the rates of every tenant who paid less than £4 in yearly rent. Landlords whose land was crowded with poorer tenants were now faced with large bills. They began clearing the poor tenants from their small plots, and letting the land in larger plots for over £4 which then reduced their debts. In 1846 there had been some clearances, but the great mass of evictions came in 1847. According to James S. Donnelly Jr, it is impossible to be sure how many people were evicted during the years of the famine and its immediate aftermath. It was only in 1849 that the police began to keep a count, and they recorded a total of almost 250,000 persons as officially evicted between 1849 and 1854. Donnelly considered this to be an underestimate, and if the figures were to include the number pressured into "voluntary" surrenders during the whole period (1846–54) the figure would almost certainly exceed half a million persons. While Helen Litton says there were also thousands of "voluntary" surrenders, she notes also that there was "precious little voluntary about them." In some cases tenants were persuaded to accept a small sum of money to leave their homes, "cheated into believing the workhouse would take them in." West Clare was one of the worst areas for evictions, where landlords turned thousands of families out and demolished their derisory cabins. Captain Kennedy in April 1848 estimated that 1,000 houses, with an average of six people to each had been levelled since November. The Mahon family, Strokestown House alone in 1847 evicted 3,000 people, and according to John Gibney were still able to dine on lobster soup. After Clare, the worst area for evictions was County Mayo, accounting for 10% of all evictions between 1849 and 1854. Earl of Lucan, who owned over 60,000 acres (240 km2) was among the worst evicting landlords. He was quoted as saying 'he would not breed paupers to pay priests'. Having turned out in the parish of Ballinrobe over 2,000 tenants alone, the cleared land he then used as grazing farms. In 1848 the Marquis of Sligo owed £1,650 to Westport Union; he was also an evicting landlord, though he claimed to be selective, saying he was only getting rid of the idle and dishonest. Altogether he cleared about one-quarter of his tenants. According to Litton, evictions might have taken place earlier but for fear of the secret societies. However they were now greatly weakened by the Famine. Revenge still occasionally took place, with seven landlords being shot, six fatally, during the autumn and winter of 1847. Ten other occupiers of land, though without tenants, she says were also murdered. Lord Clarendon, alarmed that this meant rebellion, asked for special powers. Lord John Russell was not sympathetic to this appeal. Lord Clarendon believed that the landlords themselves were mostly responsible for the tragedy in the first place, saying "It is quite true that landlords in England would not like to be shot like hares and partridges...but neither does any landlord in England turn out fifty persons at once and burn their houses over their heads, giving them no provision for the future." The Crime and Outrage Act was passed in December 1847 as a compromise and additional troops were sent to Ireland. Under the notorious Gregory clause, described by Donnelly as a "vicious amendment to the Irish poor law, named after William H. Gregory, M.P. and commonly known as the quarter-acre clause, provided that no tenant holding more than a quarter-acre of land would be eligible for public assistance either in or outside the workhouse. This clause had been a successful Tory amendment to the Whig poor-relief bill which became law in early June 1847, where its potential as an estate-clearing device was widely recognised in parliament, though not in advance. At first the poor law commissioners and inspectors viewed the clause as an valuable instrument for a more cost-effective administration of public relief, but the drawbacks soon became apparent, even from an administrative perspective. They would soon view them as little more than murderous from a humanitarian perspective. According to Donnelly it became obvious that the quarter-acre clause was "indirectly a death-dealing instrument." While the famine was responsible for a significant increase in emigration from Ireland, of anywhere from 45% to nearly 85%, depending on the year and the county it was not the sole cause. Nor was it even the era when mass emigration from Ireland commenced. That can be traced to the middle of the 18th century, when some quarter of a million people left Ireland to settle in the New World alone, over a period of some fifty years. From the defeat of Napoleon to the beginning of the famine, a period of thirty years, "at least 1,000,000 and possibly 1,500,000 emigrated" However, during the worst of the famine, emigration reached somewhere around 250,000 in one year alone, with far more emigrants coming from western Ireland than any other part. Families en masse did not emigrate, younger members of it did. So much so that emigration almost became a rite of passage, as evidenced by the data that show that, unlike similar emigration throughout world history, women emigrated just as often, just as early, and in the same numbers as men. The emigrant started a new life in a new land, sent remittances "[reaching] £1,404,000 by 1851" back to his/her family in Ireland which, in turn, allowed another member of the family to emigrate. 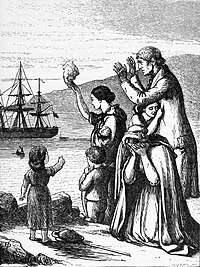 Emigration during the famine years of 1845 to 1850 was to England, Scotland, the United States, Canada, and Australia. Many of those fleeing to the Americas used the well-established McCorkell Line. Of the 100,000 Irish that sailed to Canada in 1847, an estimated one out of five died from disease and malnutrition, including over five thousand at Grosse Isle. Mortality rates of 30% aboard the coffin ships were common. By 1854, between 1½ and 2 million Irish left their country due to evictions, starvation, and harsh living conditions. In America, most Irish became city-dwellers: with little money, many had to settle in the cities that the ships they came on landed in. By 1850, the Irish made up a quarter of the population in Boston, Massachusetts; New York City; Philadelphia, Pennsylvania; and Baltimore, Maryland. In addition, Irish populations became prevalent in some American mining communities. A graph of the populations of Ireland and Europe indexed against 1750. The 1851 census reported that more than half the inhabitants of Toronto, Ontario were Irish, and in 1847 alone, 38,000 famine Irish flooded a city with fewer than 20,000 citizens. Other Canadian cities such as Saint John, New Brunswick; Quebec City and Montreal, Quebec; Ottawa, Kingston and Hamilton, Ontario also received large numbers of Famine Irish since Canada, as part of the British Empire, could not close its ports to Irish ships (unlike the United States), and they could get passage cheaply (or free in the case of tenant evictions) in returning empty lumber holds. However fearing nationalist insurgencies the British government placed harsh restrictions on Irish immigration to Canada after 1847 resulting in larger influxes to the United States. The largest Famine grave site outside of Ireland is at Grosse-Île, Quebec, an island in the St. Lawrence River used to quarantine ships near Quebec City. In 1851, about a quarter of Liverpool's population was Irish-born. The famine marked the beginning of the steep depopulation of Ireland in the 19th century. Population had increased by 13–14% in the first three decades of the 19th century. Between 1831 and 1841 population grew by 5%. Application of Thomas Malthus's idea of population expanding 'geometrically' (exponentially) while resources increase arithmetically was popular during the famines of 1817 and 1822. However by the 1830s, a decade before the famine, they were seen as overly simplistic and Ireland's problems were seen "less as an excess of population than as a lack of capital investment." The population of Ireland was increasing no faster than that of England, which suffered no equivalent catastrophe. In 1847 William Smith O'Brien, the leader of the Young Ireland party, became one of the founding members of the Irish Confederation to campaign for a Repeal of the Act of Union, and called for the export of grain to be stopped and the ports closed. The following year he organised the resistance of landless farmers in County Tipperary against the landowners and their agents. three children huddled together, lying there because they were too weak to rise, pale and ghastly, their little limbs ... perfectly emaciated, eyes sunk, voice gone, and evidently in the last stages of actual starvation. the aged, who, with the young — are almost without exception swollen and ripening for the grave. the children exhibit the effects of famine in a remarkable degree, their faces looking wan and haggard with hunger, and seeming like old men and women. One possible estimate has been reached by comparing the expected population with the eventual numbers in the 1850s (see Irish Population Analysis). Earlier predictions expected that by 1851 Ireland would have a population of eight to nine million. A census taken in 1841 revealed a population of slightly over 8 million. A census immediately after the famine in 1851 counted 6,552,385, a drop of almost 1,500,000 in ten years. Modern historian R.J. Foster estimates that 'at least 775,000 died, mostly through disease, including cholera in the latter stages of the holocaust'. He further notes that 'a recent sophisticated computation estimates excess deaths from 1846 to 1851 as between 1,000,000 and 1,500,000...; after a careful critique of this, other statisticians arrive at a figure of 1,000,000.' In addition, in excess of one million Irish emigrated to Great Britain, United States, Canada, Australia, and elsewhere, while millions emigrated over following decades. Perhaps the best-known estimates of deaths at a county level are those by Joel Mokyr. The range of Mokyr's mortality figures goes from 1.1 million to 1.5 million Famine deaths in Ireland between 1846 and 1851. Mokyr produced two sets of data which contained an upper-bound and lower-bound estimate, which showed not much difference in regional patterns. Because of such anomalies, Cormac Ó Gráda revisited the work of S. H. Cousen's. Cousen's estimates of mortality was to rely heavily on retrospective information contained in the 1851 census. The death tables, contained in the 1851 census have been rightly criticised, as under-estimating the true extent of mortality, Cousen's mortality of 800,000 is now regarded as much too low. There were a number of reasons for this, because the information was gathered from the surviving householders and others and having to look back over the previous ten years, it underestimates the true extent of disease and mortality. Death and emigration had also cleared away entire families, leaving few or no survivors to answer the questions on the census. Another area of uncertainty lies in the descriptions of disease given by tenants as to the cause of their relatives' deaths. Though Wilde's work has been rightly criticised as under-estimating the true extents of mortality it does provide a framework for the medical history of the Great Famine. The diseases that badly affected the population fell into two categories, famine induced diseases and diseases of nutritional deficiency. Of the nutritional deficiency diseases the most commonly experienced were starvation and marasmus, as well as condition called at the time dropsy. Dropsy (Edema) was a popular name given for the symptoms of several diseases, one of which, kwashiorkor, is associated with starvation. The greatest mortality, however, was not from nutritional deficiency diseases, but from famine induced ailments. The malnourished are very vulnerable to infections; therefore, they were more severe when they occurred. Measles, diarrheal diseases, tuberculosis, most respiratory infections, whooping cough, many intestinal parasites, and cholera were all strongly conditioned by nutritional status. Potentially lethal diseases, such as smallpox and influenza, were so virulent that their spread was independent of nutrition. A significant cause spreading disease during the Famine was "social dislocation." The best example of this phenomenon was fever, which exacted the greatest toll of death. In the popular mind, as well as among much medical opinion, fever and famine are closely related. This view was not wholly mistaken, but the most critical connection was the congregating of the hungry at soup kitchens, food depots, overcrowded work houses where conditions were ideal for spreading infectious diseases such as typhus, typhoid and relapsing fever. As to the diarrheal diseases, their presence was the result of poor hygiene, bad sanitation and dietary changes. The concluding attack on a population incapacitated by famine was delivered by Asiatic cholera. Cholera had visited Ireland, briefly in the 1830s. But in the following decade it spread uncontrollably across Asia, through Europe, and into Britain and finally reached Ireland in 1849. On the 1851 census both Cormac Ó Gráda & Joel Mokry would also describe it as a famous but flawed source. They would contend that the combination of institutional and individuals figures gives "an incomplete and biased count" of fatalities during the famine. Ó Gráda referencing the work of W. A. MacArthur, writes, specialists have long known the Irish death tables left a lot to be desired in terms of accuracy. As a result Ó Gráda says to take the Tables of Death at face value would be a grave mistake, as they seriously undercount the number of deaths both before and during the famine. In 1851, the census commissioners collected information on the number who died in each family since 1841, the cause, season and year of death. Its disputed findings were as follows: 21,770 total deaths from starvation in the previous decade, and 400,720 deaths from disease. Listed diseases were fever, dysentery, cholera, smallpox and influenza; the first two being the main killers (222,021 and 93,232). The commissioners acknowledged that their figures were incomplete and that the true number of deaths was probably higher: "The greater the amount of destitution of mortality...the less will be the amount of recorded deaths derived through any household form; - for not only were whole families swept away by disease...but whole villages were effaced from off the land." A later historian has this to say: "In 1851, the Census Commissioners attempted to produce a table of mortality for each year since 1841... The statistics provided were flawed and probably under-estimated the level of mortality..."
Other, perhaps less reliable and likely underestimates are that the event led to the deaths of approximately one million people through starvation and disease; a further million are thought to have emigrated as a result of the famine. Some scholars estimate that the population of Ireland was reduced by 20 to 25 percent. All of this occurred while taxes, rents, and food exports were being collected and sent to British landlords, in an amount surpassing £6 million. Consequently, later mini-famines made only minimal effect and are generally forgotten, except by historians. By the 1911 census, the island of Ireland's population had fallen to 4.4 million, about the same as the population in 1800 and 2000 and only a half of its peak population. This criticism was not confined to outside critics. The Lord Lieutenant of Ireland, Lord Clarendon, wrote a letter to Russell on 26 April 1849, urging that the government propose additional relief measures: "I do not think there is another legislature in Europe that would disregard such suffering as now exists in the west of Ireland, or coldly persist in a policy of extermination." Also in 1849 the Chief Poor Law Commissioner, Edward Twistleton, resigned in protest over the Rate-in-Aid Act, which provided additional funds for the Poor Law through a 6p in the pound levy on all rateable properties in Ireland. Twisleton testified that "comparatively trifling sums were required for Britain to spare itself the deep disgrace of permitting its miserable fellow subjects to die of starvation." According to Peter Gray, in his book The Irish Famine, the government spent seven million pounds for relief in Ireland between 1845 and 1850, "representing less than half of one percent of the British gross national product over five years. Contemporaries noted the sharp contrast with the 20 million pounds compensation given to West Indian slave-owners in the 1830s." Other critics maintained that even after the government recognised the scope of the crisis, it failed to take sufficient steps to address it. John Mitchel, one of the leaders of the Young Ireland Movement, wrote the following in 1860: "I have called it an artificial famine: that is to say, it was a famine which desolated a rich and fertile island that produced every year abundance and superabundance to sustain all her people and many more. The English, indeed, call the famine a 'dispensation of Providence;' and ascribe it entirely to the blight on potatoes. But potatoes failed in like manner all over Europe; yet there was no famine save in Ireland. The British account of the matter, then, is first, a fraud; second, a blasphemy. The Almighty, indeed, sent the potato blight, but the English created the famine." Still other critics saw reflected in the government's response the government's attitude to the so-called "Irish Question." Nassau Senior, an economics professor at Oxford University, wrote that the Famine "would not kill more than one million people, and that would scarcely be enough to do any good." In 1848, Denis Shine Lawlor suggested that Russell was a student of the Elizabethan poet Edmund Spenser, who had calculated "how far English colonization and English policy might be most effectively carried out by Irish starvation." Charles Trevelyan, the civil servant with most direct responsibility for the government's handling of the famine, described it in 1848 as "a direct stroke of an all-wise and all-merciful Providence", which laid bare "the deep and inveterate root of social evil"; the Famine, he affirmed, was "the sharp but effectual remedy by which the cure is likely to be effected. God grant that the generation to which this opportunity has been offered may rightly perform its part..."
"...[T]he government had to do something to help alleviate the suffering, the particular nature of the actual response, especially following 1846, suggests a more covert agenda and motivation. As the Famine progressed, it became apparent that the government was using its information not merely to help it formulate its relief policies, but also as an opportunity to facilitate various long-desired changes within Ireland. These included population control and the consolidation of property through various means, including emigration... Despite the overwhelming evidence of prolonged distress caused by successive years of potato blight, the underlying philosophy of the relief efforts was that they should be kept to a minimalist level; in fact they actually decreased as the Famine progressed." Critics of British imperialism point to the structure of empire as a contributing factor. J. A. Froude wrote that "England governed Ireland for what she deemed her own interest, making her calculations on the gross balance of her trade ledgers, and leaving moral obligations aside, as if right and wrong had been blotted out of the statute book of the Universe." Dennis Clark, an Irish-American historian, claimed that the famine was "the culmination of generations of neglect, misrule and repression. It was an epic of English colonial cruelty and inadequacy. For the landless cabin dwellers it meant emigration or extinction..."
Ireland's Holocaust mural on the Ballymurphy Road, Belfast. 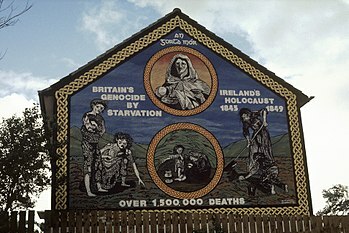 "An Gorta Mór, Britain's genocide by starvation, Ireland's holocaust 1845–1849." The famine is still a controversial event in Irish history. Debate and discussion on the British government's response to the failure of the potato crop in Ireland and the subsequent large-scale starvation, and whether or not this constituted genocide, remains a historically and politically-charged issue. In 1996 Francis A. Boyle, a law professor at the University of Illinois at Urbana-Champaign, wrote a report commissioned by the New York-based Irish Famine/Genocide Committee, that concluded "Clearly, during the years 1845 to 1850, the British government pursued a policy of mass starvation in Ireland with intent to destroy in substantial part the national, ethnic and racial group commonly known as the Irish People.... Therefore, during the years 1845 to 1850 the British government knowingly pursued a policy of mass starvation in Ireland that constituted acts of genocide against the Irish people within the meaning of Article II (c) of the 1948 [Hague] Genocide Convention." On the strength of Boyle's report, the U.S. state of New Jersey included the famine in the "Holocaust and Genocide Curriculum" at the secondary tier. Historian Peter Duffy writes that "The government's crime, which deserves to blacken its name forever ..." was rooted "in the effort to regenerate Ireland" through "landlord-engineered replacement of tillage plots with grazing lands" that "took precedence over the obligation to provide food ... for its starving citizens. It is little wonder that the policy looked to many people like genocide." Several commentators have argued that the searing effect of the famine in Irish cultural memory has effects similar to that of genocide, while maintaining that one did not occur. Robert Kee suggests that the Famine is seen as "comparable" in its force on "popular national consciousness to that of the 'final solution' on the Jews," and that it is not "infrequently" thought that the Famine was something very like, "a form of genocide engineered by the English against the Irish people." This point was echoed by James Donnelly, a historian at the University of Wisconsin–Madison, who wrote in his work Landlord and Tenant in Nineteenth-Century Ireland, "I would draw the following broad conclusion: at a fairly early stage of the Great Famine the government's abject failure to stop or even slow down the clearances (evictions) contributed in a major way to enshrining the idea of English state-sponsored genocide in Irish popular mind. Or perhaps one should say in the Irish mind, for this was a notion that appealed to many educated and discriminating men and women, and not only to the revolutionary minority...And it is also my contention that while genocide was not in fact committed, what happened during and as a result of the clearances had the look of genocide to a great many Irish..."
Historian Cormac Ó Gráda disagreed that the famine was genocide: first, that "genocide includes murderous intent and it must be said that not even the most bigoted and racist commentators of the day sought the extermination of the Irish"; second, that most people in Whitehall "hoped for better times in Ireland" and third, that the claim of genocide overlooks "the enormous challenges facing relief efforts, both central, local, public and private". Ó Gráda thinks that a case of neglect is easier to sustain than that of genocide. However, people in charge like chief of the Government relief Charles Trevelyan contradict a "neglect" but rather hazarded the consequenses from the colonial perspective that the Famine was a "mechanism for reducing surplus population" and a "judgement of God". Well-known Irish columnist and song-writer John Waters has described the famine as the most violent event in a history which was characterised by violence of every imaginable kind and stated that the famine "was an act of genocide, driven by racism and justified by ideology", arguing that the destruction of Ireland's cultural, political and economic diversity and the reduction of the Irish economy to basically a mono-cultural dependence was a holocaust waiting to happen. Waters contends that arguments about the source of the blight or the practicability of aid efforts once the Famine had taken hold were irrelevant to the meaning of the experience. The Great Famine is memorialized in many locations throughout Ireland, especially in those regions that suffered the greatest losses, and also in cities overseas with large populations descended from Irish immigrants. These include, at Custom House Quays, Dublin, the thin sculptural figures, by artist Rowan Gillespie, who stand as if walking towards the emigration ships on the Dublin Quayside.